...a survey of Learning Vitamins® features! Each drill builds on previous drills, com­bin­ing new learning with relevant review! Bible verse on each page relates to the topic of study! 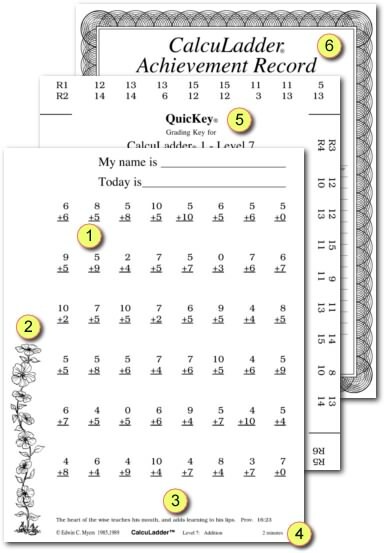 Clever QuicKeys® make grading a breeze! Beautiful Achievement Records chronicle student progress! Brief, practical SmartGuide™ gets you going in minutes! Learning Vitamins help children become better doers. With these objective drills, both you and your kids will know just where you are, and how far you’ve come after just a few short months! Weak areas will stand out clearly, helping you direct your teaching energies where they’re needed most. Virtually every second spent on Learning Vitamins sharpens skills. Thus, the drills can be very brief—typically 2 to 5 minutes—yet very potent. It’s amazing how such a quick, daily activity can produce such praiseworthy results. Learning Vitamins are so quick, simple, and flexible that you can use them at home or school. Tutorial, remedial, gifted, self-instructional, or summer review—these drills can handle it! How to Use Learning Vitamins. . . Using Learning Vitamins is simple! The most important thing is to use them every day. Here’s the basic idea: Have your student repeat a given drill once each day until he is able to complete it correctly within that drill’s suggested time goal. Grading the drills is a snap with the unique QuicKeys® whose answers line up underneath the student’s answers! When your student passes a given drill, fill in his Achievement Record and promote your student to the next drill! While individual progress may vary, students often need about 10-12 repeats of each drill to pass it. Click on the brief, practical SmartGuide™ included with your CalcuPak for further information and variations you may use.